The $25 Million Demo. 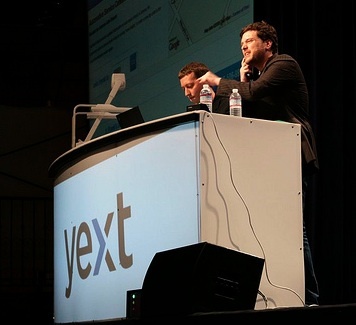 Yext Scores A Big Round From IVP After TechCrunch50 Debut. Over the past three years, Lerman and his co-founders (who all went to the same high school together in Virginia), have built a local advertising business under everyone’s nose that is on track to generate $20 million in revenues this year.Yext is going after the huge, entrenched Yellow Pages business with online ads for local businesses that result in phone calls instead of clicks. At TechCrunch50, which was the company’s public debut, Yext relaunched with a whole new product, going from plain vanilla pay-per-call ads to pay-per-action ads where the action is a relevant call that actually drives new business. Each ad has a unique trackable number that goes through Yext’s system, where it is recorded, transcribed, and analyzed. Yext customers get their own inbox for calls which is like a Google Voice for businesses. There is a transcript for each call, the phone number of the person who called, and a full audio file that can be played back. When a business signs up, Yext places ads for them across the Web in local directories such as Yellowpages.com, SuperPages.com, Local.com, 1-800-Free-411, 4Info, Topix, and more. It turns those ads into phone calls. Yext uses speech-to-text recognition licensed from IBM and fine-tuned with its own algorithms for each business category it targets. Co-founder Brent Metz used to be an engineer in IBM’s speech science labs, and his name appears on many IBM patents. Only when certain key words related to the actual services offered by the business are mentioned in a call (“spinal decompression,” “oil change,” “install countertops”) does Yext charge for it. Wrong numbers, marketing calls, or calls from beyond a pre-determined geographic area are put in a junk folder and Yext doesn’t charge for those. This means Yext needs to be really good at both driving relevant calls to local businesses and identifying them. “You’ve got to be transparent,” says Lerman. “We take all the risk, then we pull our pants down and show them what they get.” Lerman is so confident of his technology that at TechCrunch50, he switched all 20,000 local businesses already using Yext over to the pay-per-action system. It is a big, gutsy bet. The minute he stepped off the stage, Lerman was inundated with emails and business cards from seemingly every venture capitalist and M&A officer in the room. He tried to ignore them and soak in the rest of the conference, but some of them were from people any startup CEO would be foolish to ignore. He took a few meetings with the most serious VCs, and ended up closing a $25 million B round, led by Institutional Venture Partners (which is also an investor in Twitter). The money just hit Yext’s bank account a few hours ago. “Anyone who doesn’t launch at TechCrunch50 is crazy,” says Lerman. IVP partner Dennis Phelps will be joining Yext’s board. Sutter Hill Ventures, which had put in $3.5 million in an A round in June, 2008, also participated in this latest funding. Yext is currently only in 12 local categories, including auto repair, chiropractors, gyms, vets, and yoga. There are 2,300 Yellow Pages categories. Lerman is going to take the $25 million and aggressively expand into those categories, hiring sales people to go after each one. He already has 75 employees. Lerman is also extremely excited about getting Yext numbers into mobile apps. He thinks he can build an AdSense for mobile phones. “What do you think is the perfect action for mobile?”he asks. “It is a phone call, not a click.” App developers who sign up here can freely import Yext numbers into their apps by business type and category. So a travel app could bring up nearby auto garages or window repair shops for stranded travelers and get a cut of any call revenue they generate. Lerman has a lot of ideas like that.